For almost seven years now, folks at BTC Elements have been combining fashion with sustainability to offer unique, handmade, recycled fashion objects and accessories to their clients. With “Be The Change” being their motto, the online boutique flaunts unique jewelry items which you can consider wearing on any occasion. Made from recycled sterling silver or 14K gold fill, the exclusive, sustainable range of jewelry deserves your patronage for sure. While the Recycled State Pride Necklaces –with state border silhouettes and states names inscribed – let you flaunt your affection for your home state, the Zodiac Sign Necklaces have a perfectly designed zodiac sign within a teardrop shaped ½-inch pendant. Drawing its inspiration from the nature itself, the Recycled Butterfly Necklace may complement your style if you plan to wear it with simple jeans, t-shirt or just anything. Next on the list, we have the fully adjustable Tiny Star Necklace. The Leaf Bracelet is yet another one-of-a-kind jewelry item that should tickle the fancies of any fashionista. 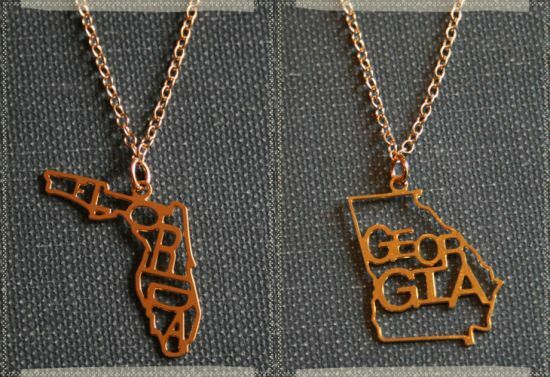 Those who love to flaunt their initials through attires they wear should consider buying the Tiny Initial Necklaces. These necklaces have tiny little letters inscribed in a Parisian-esque font on ¼-inch pendants. Equally appealing is the Tiny Heart Necklace available in recycled 14k gold or sterling overlay. Priced at $25-80, the cool jewelry items make the perfect must-buy. So, what’s your pick?